We’re all human. And sometimes being human means our egos can get the better of us. Generally, it’s okay when this happens. We can keep ourselves in check and try to be better people. BUT, what happens when our egos creep into our business and, more specifically, our websites? 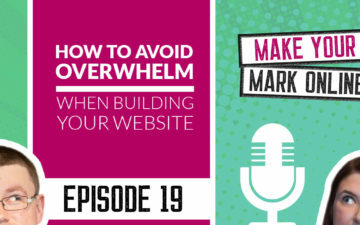 In this podcast episode, we’ll be going through our top ego-driven, website faux-pas that will drive your end-user insane! Looking pretty is way more important than user-experience, right? 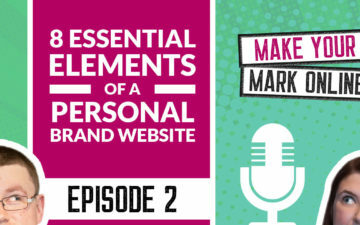 Welcome to episode 20 of the Make Your Mark Online podcast. 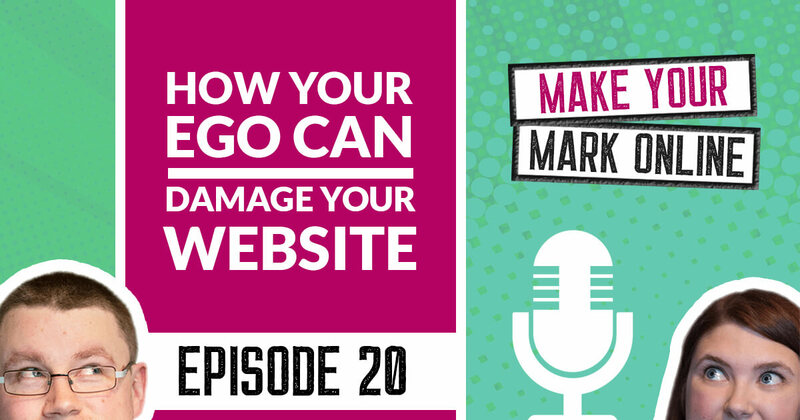 Today, we’re going to be talking about how your ego can stop you from having a successful website. 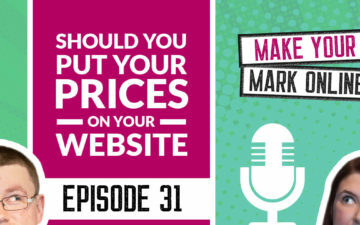 But before we get into the show, this podcast is sponsored by the Make Your Mark Online membership. This is our signature membership community, where we help personal brands build and grow a successful business website. The doors for the membership are currently closed, but you can check out the details at the MakeYourMarkOnline.net website, and you can join the wait list, and we’ll notify you as soon as we open the doors again in January. Now, just before we get into the show, we just wanted to let you know that this is actually the end of season one of the podcast, as Lyndsay is now going off on mat leave. I am, yes. And you’re going to be all by yourself, aren’t you? I am, yeah. It’s going to be lonely. It’s going to be lonely for you. Yeah. But we felt that this would be a nice place to break up the episodes so that I can take it from here as a solo show for a few months until you come back next year. Yes. And I’m hoping the listeners don’t double while you’re doing your solo show. That would be really embarrassing, wouldn’t it? We just can’t get enough of this manc accent. Yeah. Get rid of her. But we are actually continuing straight on with season two on the podcast, so there won’t be any gaps. So it’ll just be the next episode next week as normal, but it will just be yours truly instead of the both of us. So yeah, let’s get into the show. So Lyndsay, this episode is all about ego. Yeah, it is interesting because I think we can all have a bit of ego from time to time, and we all are human, and sometimes ego creeps in. But sometimes, it creeps into our websites, and this can actually make them less successful, and it can kind of harm your conversions and things like that. So yeah, that’s why it’s quite a good topic to talk about I think. Yeah. I think you’re right. And I think it’s when we forget about the end user mor than anything else. And you see it a lot on websites these days, and we focus on ourselves and our business rather than our potential customers. Yeah, definitely. That’s pretty much the nail on the head of when ego creeps into our websites, and as Martin always says, your website is not about you. So I have to say, this is actually something that impacts a lot of personal brands. When you’re a personal brand, it’s tempting to make everything about yourself. You’re selling you, which I get, so it’s quite difficult not to. But we can easily fall into the trap of kind of making everything about ourselves and our brand and kind of forgetting about that end user. So it’s quite a difficult one for personal brands, I think. Yeah, it’s definitely a difficult balance, I think, isn’t it? And it’s not just personal brands, as well. Big businesses also fall fowl of this, as well. It tends to be there’s a certain arrogance of being a big business or a larger business. Big business websites also tend to make quite a lot of mistakes with their website, too. Yeah, definitely. It’s not just the little guys that, like you said, fall fowl of it. It is big businesses as well, so we see countless examples of this when we are just browsing the web all the time, and it kind of irritates us, doesn’t it? So yeah, it’s not just the little guys. Definitely not. Okay. So from all of our research and all of the websites we’ve reviewed over the years, big businesses and small businesses, have we got a list of things that we can do to make sure that we kind of leave our ego at the door? Yeah, I think the first thing that we constantly talk about is about your “about” page, and a lot of businesses make their “about” page just about themselves, and I get why because you think “about us”, “about me” is just going to be about you, and you see this sort of start of the page that says, “I graduated in 1984 with this thing, and I did this, and I’ve done that, and I am brilliant.” And it can kind of put your end users off, really. They’re not going to be interested in that information. Yes, they want to know you’re qualified and things like that, but that “about” page is just either going to be really boring for them or it’s just going to turn them off and make them think you’re a bit of a big head. Yeah, but I don’t think it’s your fault a lot of the time, as our listener. I don’t think it’s your fault because people say, “About me. This is about us. This is our “about” page.” And this is the one page where you think that you can actually talk a little bit about yourself and not your customer’s problems, but that’s not true, actually. You don’t have a lot of wiggle room on this one. But yeah, the “about” page actually is one of the busiest pages on your website. It’s one of the pages that draws in a lot of traffic. So yes, it’s okay to be about you a little bit, but more than anything you have to remember that if somebody’s clicking on your “about” page, they still want to do business with you, and by having a big block of text saying all about you, it does put an extra barrier into play, in the waves, doesn’t it? Yeah, definitely, definitely. And I think, yeah, you’re right, maybe sometimes it doesn’t come from a place of ego, it’s just a case of, “I’m unsure of what to put on this page, and I’m just going to talk about myself for the next paragraphs.” But yeah, I think that it just comes across as very self-centered when we just talk about ourselves on our “about” page. I’m not saying don’t talk about yourself at all, but you need to put the onus really on the end user, and more make it about how you can help them. We actually have an episode, a podcast episode about how to write an “about” page, and I’ll put that in the show notes because that explains it quite clearly in there. But that’s a big, epic one, really, that we talk about quite a lot, where your ego can creep in, and you can end up just being quite self-focused. Particularly on that page. And as Martin said, it’s quite an important page on your website. It’s usually well trafficked, so you want to make sure you’re taking advantage of it and actually getting people to do something, and connecting with people, and getting them to actually convert into a customer or lead on that page, not just talking about yourself. Yeah. It is important because every page on your website is a sales page. Okay. So what’s next, and what else are we doing out there that may cause our ego to get in the way of getting customers and leads? Yeah. People offer a newsletter. Sometimes it comes as a pop-up, which is like a double whammy of joy. It’s like a double [crosstalk 00:07:16] around your face. And I get why people do this, I do. A lot of people offer just a newsletter in exchange for someone’s email address, and sometimes you just say, “Sign up to my newsletter.” Sometimes we say, “Sign up to my newsletter and get my latest news.” Or thoughts, or whatever it is. But you have to think, how much do people really care about your latest news? Do people care that we got a new office plan this week? Probably not. I don’t know. And I think, yeah, I think newsletter just isn’t good enough really to get someone’s email address. You have to be respectful of someone’s personal information. If you’re requesting that information, you kind of have to give something in exchange for that. You can’t just say, “Sign up to my newsletter.” Because at the end of the day, people probably don’t care. It’s your ego coming into that, I think. Yeah, and we’re not saying that you can’t tell people about your business and what you’ve been up to, but the idea of a newsletter and you saying the word newsletter makes it feel like it’s just going to be a bulletin about you and about what you’ve been up to. So we’re not talking about, you don’t have to not tell people what you’ve been up to. It’s great to learn more about you and about how you run your business and let everybody get to know who you are, but try to avoid using the word newsletter because I just think it’s becoming … there’s a negative effect that it’s having out there, so you’ve got to be careful. When I see the word newsletter, I think I’m going to sign up, and I’m going to learn about what you think about things and what are your thoughts and feelings, and it’s very internal rather than thinking about your customers. So just something to be aware of I think [inaudible 00:09:09]. Yeah, definitely. And actually, some businesses offer really, really good stuff. They offer really good stuff in emails every week, but they just call it a newsletter, and I think if they called it something else, I think they would find that conversions on that call to action a lot better, definitely. But yeah, just newsletter, like Martin said just sounds like it’s going to be just about you and your company and what’s going on in your life, which is fine to talk about, but you don’t want to be talking about it all the time. So to get people’s email address, yes, I think you either need to give something away for free, something meaty in exchange for their email address or just reword what the actual newsletter is. Yeah. Unless you’re famous like Ann Handley and Chris Kroeger and these people that just from saying newsletter, it’s like, “Oh, I’d actually like to know what they’ve been up to. I’d actually like to know if Chris has got a new video game playing on.” But again, we’re not all at that same level. So you have to think about your customers more than you think about yourself. Okay, so what else are we doing? What else are we doing that’s infuriating you today? This is great. This is a great eight and a half month pregnant episode. Just rip into things. Another one would be using silly names on websites for normal stuff. It really, really irritates me. If I see the words “My Journey” instead of “About” on a homepage menu, I’ll go insane. Yeah, I think people have this idea of wanting to be kind of quirky and different, so they give things different names. I’ve seen “blog” called “growth zone”, I’ve seen all sorts of different things. Yeah, or “our stories” as the blog. And I’m like, what? “Our stories”, yes. That was a strange one. That’s the most egotistical thing I think I’ve ever seen on a website. Crazy. Yeah, I think it is. It is very much like that. And it’s a mistake that a lot of people do make because they want to be different, but if you think about it from the end user’s point of view, and I think this is the point that we keep making, it’s that they know immediately what “about” is, they know immediately what “blog” is, and they can easily get to those pages, and they don’t have to think about it. Whereas, if it says “my journey” or “my stories”, that doesn’t make any sense really to anyone. Yeah. Imagine if you were to walk into a shop and they changed the aisles. Rather than “dairy”, they said “cow stuff”. That’s the worst example I’ve ever used in anything. Okay, so “vegetables” is “plant stuff”, and you’ve just got to kind of figure it out for yourself. I actually would like to shop there. I know. That’s our next business. Settled that. But you see what we’re saying. It’s about not letting your visitors think, like, why are you making them jump through hoops to access information that they already know, like, and trust, you know what I mean? We wouldn’t change the name “website”. We could just introduce a new way to say website, but it’s like, what’s the point? People know what it is. And I think this is the thing of, like, big businesses do this a lot we find as well. They kind of use this weird terminology, and there’s absolutely no reason for doing so. You’re still laughing at “cow stuff”? I’m still laughing at “cow stuff”, you’ve made me giggle too much. So I think, yes, I think stick to the normal names for things, make it easier for your end users, and try not to be different and unique in that sense. It doesn’t mean in your actual copy you can’t be yourself and reflect your brand, but I think when you’re naming pages and things like that, try to stick to the normal stuff, really, rather than using “cow stuff”. Yeah. Don’t forget about SCO as well, because if you have a service page where you offer, and we’ve said this before about, let’s just say that you’re a solicitor, and you offer will writing or whatever, and you decide to call it something completely different, then people searching online won’t be able to find it because they know the terminology that they’re used to. So it’s kind of a negative impact in terms of traffic as well. Yeah, definitely. So I think further on with this is a lot of businesses care more about how their website looks than user experience. They do do that. Why? It’s really difficult to read. They do. Why is that just a luxury brands thing? It seems to be, doesn’t it? I don’t know, they just … I don’t know whether the customers just have really good eyesight. It’s not aimed at us. We wear glasses. We’re not good enough for these luxury brands. I’m really not sure. I mean, I went on a luxury brand website today to try and look at this, and also their product descriptions are terrible. There was one who was advertising a suit for 3000 pounds, and the product description had six words. And I get, you don’t want words to reflect badly on your organization, to look ugly on the page, but people might want to know a little bit more when they’re spending 3000 pounds on a suit. Imaged based, and branding. And what you’re saying really is that branding sometimes and design can get in the way of user experience when really we should be using users to come up with design. How a website’s built and constructed and looks should be based around your target audience, otherwise, it’s just about you, and that’s where the ego comes in. Yeah, exactly. If you want a good example of this, Apple, their website is quite a good example of a website that is both beautiful, but also thinks about their users as well. They do it quite, quite well, and it is possible. You have to get that balance right, I totally understand that. It’s not good to have an ugly, user friendly website, but I think you have to think about your end user. If you have something so beautiful, websites aren’t a piece of art, they’re not there to be looked at. They’re there to actually do something, so don’t try and get so hung up on how it looks to much so that the end users are the ones that suffer really. Yeah, no, that’s a great point, and I think it’s a fairly common thing. Especially when you’re building the website as well. This happens a lot because you’re thinking a lot about how you want to be perceived and what people will think, what your friends and family will think when they see your website, and you want it to look amazing. But while you’re thinking like that, you’re not thinking about your customers or the people that are going to give you money. And in some cases, you’re thinking about your competitors, which is very strange. Yeah, definitely. And that actually leads us on to the next point actually, which is businesses that think about their competitors too much. The way we think about our websites. Yeah, and a lot of businesses do this. We know from working with businesses and talking to businesses that they are, a lot of them are quite bothered around, “Such a body’s got this thing, and such a body does this thing, and we’ve got to be better, we’ve got to do this, and we’ve got to do that.” And there’s a lot of focus on what your competitors do, particularly in our industry, so web design. Web designers are terrible because we use sort of jargony language and try and look like we know exactly what we’re talking about and use really technical terms and try and show off in front of each other. Exactly. Like PHP and having all these little weird languages on your website to try and appeal to your customers in the hopes that they’re going to be baffled and they’re going to buy from you because you know more than them is such an outdated way of looking at a website, and that’s what a lot of web designers do. We talk a lot about people in other industries. We talk about accountants and the way that they use their language, and sometimes they come across stuffy, and we talk about … we don’t want to leave web designers out of it because they do a lot of really bad stuff as well. So when we use examples sometimes, we might tend to focus on certain industries, but we’re not the best, the web design industry is one of the worst for this. So you shut up and sit in a corner and just give us your money. Give me money, yeah, and I will do what I can do. Whereas I think there’s arrogance about it, but pretty much anyone who wants to apply themselves, could be a website, it could be an accountant, it could be any of these things, you can learn it, and there’s no need to be arrogant about it really, so we try to explain things in as simple language as possible, and I think that’s something you should do on your website. I don’t know, someone famous, I think it was Einstein, he said something like, “If you can’t explain it simply, you don’t know it well enough.” Or something like that, which is true. You’ve got to explain it in terms of how your end user is going to understand it. But it’s just such a difficult one because even now, even though we’ve tried to dedicate a hundred percent of our efforts in creating content for our customers, you still get in the back of your mind an idea for a blog post that is, this is going to make us look great with our competitors, and it’s difficult to get out of that role, but it is important, and when you do get the thought, “I’ve got a great idea for a podcast episode or a blog post.” Just ask yourself, did you come up with the idea because it will make you feel better, and it will make you look good with your peers and your competitors, or are you creating that piece of content because it’s going to help educate your customers or help make them into a potential customer like a lead or a sale? Yeah, exactly, and that’s a really good point. And I think the final thing is when businesses just use their blog as a promotional tool. That really, really grates on me. Yeah, much like the newsletter, isn’t it? Yeah, “Office makeover this week.” And it is just, why would anyone be interested in that? I just don’t understand it at all. I mean, they’re sort of aiming at bigger corporations, but I still think, you’re still speaking to someone, and it doesn’t mean that you can just show off about yourself. It’s unbelievable ego really that comes into that. A blog should be there to educate your end user, provide helpful content, and it doesn’t mean that you can’t try to get leads from that, we’re not saying that, definitely the opposite, but it definitely shouldn’t be there just to shout about yourselves because it’s just boring. Yeah, exactly. And we don’t want you to not think about your experiences and your stories because we recently started introducing a little bit more about the internal running of our business as well, but we always do it from a customer point of view. So for instance, the last podcast that we released this week was how much money we had made from doing free website critiques. Now, on the face of it, that looks like a very egotistical blog post. It did feel that way when I was writing it. And we were a little bit concerned about publishing it, which is why it took us two or three weeks to hit the publish button. But an actual fact we were thinking about, how can this help our customers create better content? How can this help our visitors think about marketing in different way and how it works, and what can they learn from our experiences? And if we’d have blogged about every recent award that we’d won or our latest bean bag in our office, then how does that help anyone? So I’m not saying you can’t do it, you can’t talk about your experiences in your business, but think about the customer’s spin. And I just want to add one more to this, actually because we’ve not mentioned it, but it’s about your logo. I can’t believe we missed it. I need it nine foot, Martin. Yeah. Actually, can you make people scroll down so that they have to get to the actual content because I want my logo so big. Yeah. Make my logo bigger. No, this is just something that we get asked a lot, and we do joke about it quite a lot, but so many businesses still have a big logo. Someone recently hired us to redesign just their homepage because they had a current website, they were getting lots of visitors, but it wasn’t converting, so they had hired us to just design a homepage and then give it to their development team so that they can build it, and the only thing that they changed was the logo. Everything else was pixel by pixel perfect, exactly as we’d designed it so that we can increase conversions, but you know that she’s … this customer had obviously just said, “Actually, can you just make my logo bigger?” And it changed the entire design, really. It just pushed everything else down, and everything else was not in the right proportion. And I get that she was proud of her logo, but it does get in the way, and it’s important to remember that when someone’s on your website, they don’t really care about the name of your business or your brand. They just want you to help them buy from them. They just want your support as well. Yeah. Definitely, absolutely, I agree. So I think in conclusion, what we’re trying to say is just think about who your customers are and what they actually need from your website and from you, and try to be a bit humble on your website. Try and think, okay, so what does my end user actually want from me? Do they want a huge logo and a blog that just talks about the awards I won? Or do they want something more? And just really just about helping people and not at all hyping yourself up, really. I think that’s what your website should be about, definitely. Yeah. Fantastic. Well, I hope you found this episode useful. I know that we can all find ways to improve our websites and leave ego at the door. If you didn’t already know, we have a free Facebook group. We’d love you to join. If you go to JammyDigital.com/Facebook, we do regular training, we do free website critiques, and we’d love to help you improve your website as well. So that’s it for today’s episode and season one of the Make Your Mark Online podcast. I know. I know, but I will see you next week for the start of season two of the Make Your Mark Online podcast. I’ll see you then.